The name is believed to have come from the gate on a fence that crossed the tracks of the Beaumont, Sour Lake and Western Railroad. It was 1911 when the plat for the community was drafted, but it was two years before it was filed. A post office was in operation from 1912 through the mid 1920s. The town seems to have peaked with a population of 60 in the 1950s. The town had three businesses. There is no discernable town center and buildings are dispersed. It retained its listing as a community as late as 1990. 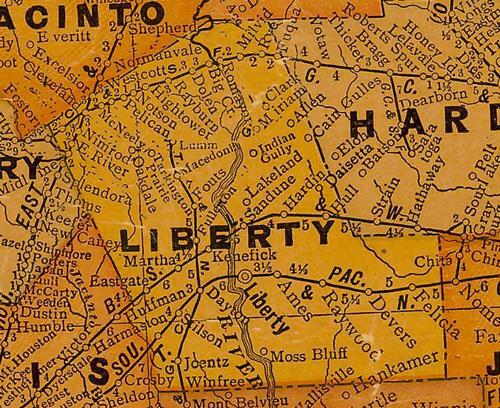 I have relatives who settled in Eastgate in Liberty County. [Here is] a history I wrote up for my book. The little village of Eastgate that never quite materialized according to its original plan is located near the junction of FM Rd. 1960 and 686, thirty-three miles northeast of Houston in western Liberty County. The name of East Gate (later Eastgate) came about in 1908 when the Beaumont, Sour Lake and Western Railway was built through the area that was thickly populated with cattle ranchers with large herds of cattle. For their convenience, so that they would not have to build loading pens and platforms, the railroad built the necessary pens with gates at the west and the east fences. It was at the east gate that the village of Eastgate had its beginnings. At that time, it was wild cattle prairie country, uncultivated and flat with no drainage. The town plat was drawn by J.C. Perry in 1911, but it was not filed until two years later. However, I.J. Gallia from Engle, Texas in Fayette County, who had moved to Houston, was a land agent who was promoting tracts of land formerly held by railroad companies which offered much of these holdings as collateral for their operations. Some of these companies fell into bankruptcy, and their landholdings were advertised in local and New York newspapers. Apparently, Gallia and Perry collaborated in acquiring these tracts. Gallia was then influential in selling this land to Czech families, which included the Janaceks and Fišers from Fayette County. Some of the land around Ammannsville was sandy and not very productive, so the Czechs in that area were looking for better land. They were told that the land in the Eastgate area was not sandy and would retain water. However, they were not told that the soil had a high clay content, which would retain too much water in times of excessive rain. In 1912, four more families arrived - Joseph and Rudolph Hajovsky from Fayette County, Vinc Buchta from Sealy in Austin County, Karel Parma from Bryan, Bartos Vyoral, John Kovalcik and M. F. Janacek. The Czech families, with their usual vigor, went to work to break the land for farming, which in the beginning was rather poor and produced few crops, but as the land was worked over and over, better and better crops were produced. In 1915, additional families arrived; namely, those of Anton Smykal, Moric Beran, Joseph Vyoral and Joseph Krajca. In July 1915, Mass was celebrated for the first time with six families present. This was the beginning of the origin for this being a Czech parish. At first, a priest only came every three months; however, later it was once a month. In 1917, the local Czechs began contemplating the idea of building a Catholic church. With this idea in mind, Emil Hajovsky and Marcell F. Janacek made rounds among all of the Czech Catholics to collect monies for a church. With another donation made by the Catholic Extension Society, a church was built in 1918 on two acres of land donated by Anna Fišer Janacek. The furnishings were purchased with various donations, including $184.00 again donated by Anna Janacek. The church was named St. Anne in honor of Anna, a benevolent donor who contributed a substantial amount of money in addition to the land for the church. Two acres for a cemetery were donated by I.J. Gallia, the land broker who had sold the initial tracts of land. 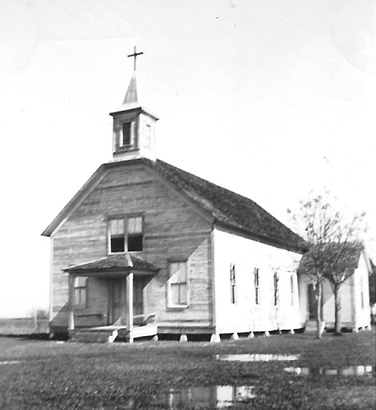 In 1948, it was decided that a larger church was needed, so M.F. and Vlasta Janacek donated two and one fourth acres of land located approximately two hundred yards south of the old church in the Eastgate "townsite". With considerable effort, the parishioners raised the funds necessary for the church's construction under the supervision of brothers M.F. and Henry Janacek, grandsons of Peregrin and Filomena Fišer; they also designed the building. The brick veneer structure trimmed in white brick décor around the windows and doors had a 44-foot steeple and a seating capacity of 300. It was built at a cost of $20,000, because the labor was donated. The old church was used as a parish hall for a while until it was dismantled and replaced with a new parish hall. M.F. Janacek owned the Eastgate Cash Store that was located on his property. Along with the store, he also had a dance platform, which was often used for church picnics, and an ice house, which provided ice for cooling prior to electricity. The store was the center of the community - a place to shop, visit, and share the local news. A post office was operated from 1912 to 1925. A cotton gin was established by the J.E. Navratil family, which they operated into the 1930s and then sold to Oscar Sobotik. Adolph and Rosie Filip and family occupied their residence with Mr. Filip serving as the ginner under the Sobotik ownership. The gin was later acquired by Anton Bederka, who operated it until the 1950s. During the World War II era, rice farmer Ed Stoesser began acquiring land along the northern side of the railroad from Czech farmers, who had formerly cultivated the area. The economy changed during and after the war, plus a trend toward rural depopulation was caused by government controls on crops, especially cotton, and cuts in quotas, all of which caused a loss of income and forced moves in search of jobs in urban areas. Increasing mechanization, which replaced manual labor, also contributed to large scale operations that were consuming the small farmers, in spite of the added conveniences of paved roads, electricity, communications and other technology. Stoesser drilled his first major irrigation well almost directly across the road from the east side location of the Joe D. Fisher home. Rice fields could be seen far into the horizon. The well more than paid for itself within the first year as demand for rice increased. During the mid-1950s, Eastgate had a peak estimated population of 60 persons and three businesses. Churches, a cemetery and scattered buildings were dispersed in the area in 1990, when Eastgate was still listed as a community, although the original vision for something bigger was just a "pipe dream".